You may be looking for that perfect gift for your culinary-minded friend, and your thoughts are turning to the artifact instead of the experience. My favorite culinary artifact of late is the DC-shaped cookie cutter. It’s available at Hill’s Kitchen, and this morning I used it to craft up these lovely Biscuits of Columbia (which I covered in sausage gravy and served with pork in a bizarre political statement). They also offer other states, if you’d prefer a California shaped cookie, or a Pennsylvania shaped cake. That is so strange. 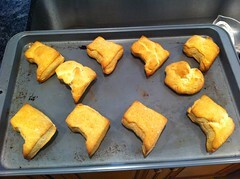 I gave you that cookie cutter, yet I did not get a delicious-looking biscuit this morning. Hmmmm….